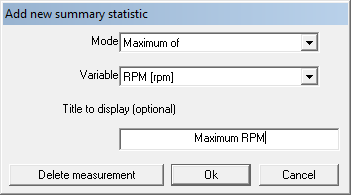 The Summary Statistics window is accessible from the Results > Summary Statistics or by clicking the button on the toolbar. The Summary Statistics tables are a quick and convenient way of checking the most important and interesting statistics from all the data currently loaded. The software comes configured with a number of statistics which most users will find useful, however, the table can be completely configured by the user to their specific requirements. The first table has columns which displays the results from the best single lap, the average of all the laps loaded, and the worst lap loaded - finally you get the results from the "best theoretical lap". Note that the results of "best theoretical lap" will be the same as the best single lap if only a lap marker has been added and no track markers. The Second table shows the results for each lap for every run loaded. Fill in the details for the statistic you want, name it appropriately, then click OK to add the statistic to the table. If you click on an existing statistic, you can edit or overwrite it. You can also delete a statistic by clicking the "Delete measurement" button in the popup dialog. For a comprehensive list of what modes are available, click here. For a list of the standard variables available, click here. To learn how to create user defined variables, click here. Please note that if you close the Summary Statistics window before you save the custom layout of the window, all your personal statistics will be lost. To learn how to save and load a custom window, click here.